The following is a brief recap of the Tues., Feb. 7, 2017, BPS101 Regular Board Meeting. View the agenda and all supporting documents from this meeting and minutes from previous meetings. View BATV’s recording of this meeting. Batavia High School Scholastic Bowl Team members were honored by Board Members for earning a spot in the National Academic Quiz Tournaments (NAQT) State Meet in Champaign, Ill., on Sat., Feb. 11. BHS junior Billy Dremel was also honored for being named Scholastic Bowl All-Conference. Led by BHS Science Teacher Daniel Renz and English Teacher Kimberly Pearlman, the BHS Scholastic Bowl Team surprised Board Members with a mini Scholastic Bowl (academic trivia competition) during the Board Meeting. Five brave Board Members squared off with the students. It was a tough competition, but in the end, the students prevailed! Both sides were great sports and everyone came away with an even greater appreciation of BPS101 academics and student achievement. 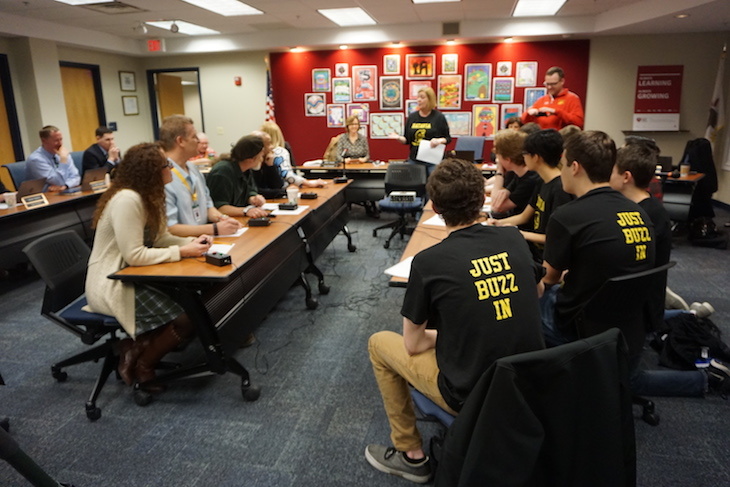 It was the BHS Scholastic Bowl Team vs. BPS101 Board Members during the first-ever Mini Scholastic Bowl at a Board Meeting. BPS101 Chief Financial Officer Tony Inglese walked Board Members through the District’s Five-Year Financial Forecast for fiscal years 2018-2022. Mr. Inglese explained how increasing costs, driven primarily by increasing salary and benefit costs, are projected to exceed revenues over the next five years and how declining enrollments are expected to reduce state funding and hinder revenue growth. For the short-term, he recommended “Scenario B” from the Forecast, which relies on natural attrition (employee turnover). He cautioned Board Members, though, that natural attrition can’t be the long-term solution to maintaining a balanced budget. Instead, he said sustainable and mindful structural changes will need to be made. At the end of the discussion, Superintendent Dr. Lisa Hichens said that the Administration will develop multi-year plans for long-term structural changes, which will be discussed at future meetings. The recent passage of the Local Government Travel Expense Control Act requires that school boards regulate the reimbursement of all travel, meal, and lodging expenses. The Board had a lengthy discussion about a major component of the Act—the maximum allowable amount for staff travel, meal, and lodging expenses. At the end of the discussion, the Board considered a maximum allowable amount of $500 per day. The Board will vote on a final resolution at the Tues., February 21 Board Meeting. The Board voted 7-0 to approve the collection of policies and exhibits from sections 6 and 7. Tues., March, 21, 7 p.m.
Tues., April 4, 7 p.m.